Each step of the process went smoothly. A white 2000 Chevrolet 3500 Cutaway handi-van sporting a ‘Sundre’ decal above the rear door pulled into the City of Wetaskiwin maintenance shop and went up on the hoist. City of Wetaskiwin mechanic Brian Walker conducted a mechanical inspection and verified the vehicle was in acceptable shape. Former owner Jerry Leussink, Rocky Mountain Charters handed a set of keys to the new owner, the Wetaskiwin Community Transportation Society represented by Alderman Mark McFaul. Perhaps the most important step in the entire process was when Cliff Reed, President of the Wetaskiwin Lions rolled out another cheque that he presented to McFaul to complete the van purchase. The Lions Club decided back in July of 2011 that the purchase of handi-vans is needed and would benefit the community. They set aside $5000 of their casino funding every year to assist with purchase of vans. 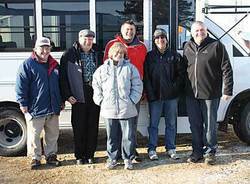 On July 25th, 2011 they made a substantial donation of $30,000 to the Wetaskiwin Community Transportation Society (WCTS) for their first purchase of a van. Club President Cliff Reed describes their financial support. “The values of the Lions are to work for others. There is no ‘self’ in Lions. Another value of Lions is the family….The Lions Club is a family working together to do the things needed in the community where the government doesn’t find enough money”. Jerry Leussink, owner of the van explained the chain of events leading up to the purchase. “I purchased this unit from the Sundre Community Van Association and was part of that Association as well. I had my own charter business called Rocky Mountain Charters renting out buses to community and any other groups that needed charters in the three western provinces.